Holding companies, or limited liability corporations, are one way to save thousands of dollars in sales tax when you purchase luxury RVs. Lets say you’re thinking of buying a high end motorhome. If so, sales tax will likely be a significant piece of the total price tag. 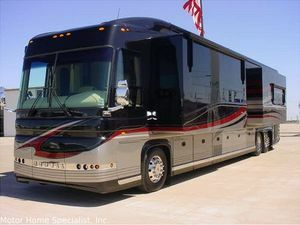 With luxury RV coaches easily costing $500,000 and more, that little 7% sales tax can amount to serious money. There is a perfectly legal way to avoid giving the government that $35,000, ($500,000 at 7%) or more. When a business purchases a vehicle, they are not required to pay sales tax. In the state of Montana you can set up a Montana holding company, have your RV registered under that corporate name, and you won’t be liable for sales tax. You don’t have to go to Montana to do this, it can all be handled through the mail. This isn’t an option for everyone. There are annual legal fees and yearly correspondences to contend with, and it’s going to complicate your income tax paperwork too. The pros and cons of a limited liability corporation should be carefully studied by your attorney. For secondhand, or less expensive RVs, setting up holding companies is probably too time-consuming and expensive to be of any real savings. It’s a legal loophole for those who can afford to invest in an expensive RV, and most likely already have business and legal obligations that require lawyers and accountants.